The structure of a prokaryote is very much simpler than that of a eukaryote. There are no endomembranes, endosymbionts, nucleus or cytoskeleton. The DNA is carried on the genophore, a circular chromosome, in an ill-defined area of the cytosol called the nucleoid. The chromosome is attached to the cell membrane during cell division (fission), frequently at a point called the mesosome. πρό-καρυον (pro-karyon) - before kernel. No nucleus - free circular genophore. Cell division by fission, genophore attached to plasmalemma by mesosome. Few membrane-bound organelles, no double-membrane bound organelles. They are 'small' because diffusion limits the rate of transport across the cell - 1 μm. The cytosol contains oil droplets, food reserves and the 70S ribosomes, and is surrounded by a plasmalemma. 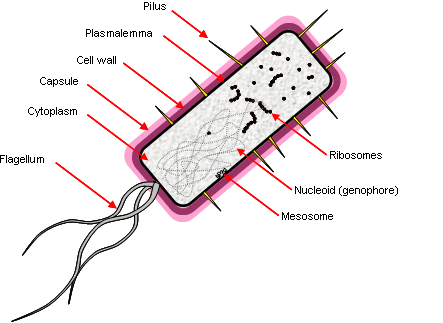 In Gram negative bacteria, a further outer membrane surrounds the plasmalemma, with a thin cell wall and periplasmic space trapped between them. In Gram positive bacteria, there is no outer membrane, and the cell wall is thicker. The cell wall is composed of peptidoglycan and various organic acids in Eubacteria. Bacteria have flagella, but they are simple proteinaceous strands attached to a rotary motor, completely dissimilar to the complex eukaryotic undulipodium. Membranes may be present in the cell, as in the thylakoids of the Cyanobacteria. In gram-positive bacteria the mambrane may form mesosomes, which are invaginations in the cell membrane that may be involved in DNA replication and oxidative phosphorylation. The cytosol may also contain various episomes (small circular chromosomes), some called plasmids, and others called (bacterio)phages, which are bacterial viruses. Proteobacteria - Gram-negative, two cell membranes, hugely diverse, Escherichia coli. Firmicutes and Actinobacteria - Gram-positive, thick peptidoglycan cell wall. Prokaryotic DNA lacks histones (packaging proteins), although other packaging proteins are present, and molecules have easier access to DNA compared with eukaryotes. They generally have efficient genomes, with little sequence other than coding sequence or regulatory sequence. Transcription leads to translation with no intermediate processing, which allows several genes to be encoded in a single transcriptional unit (a polycistron). No bacterial introns exist. They have small (70S) ribosomes. This page was last modified on 17 May 2018, at 01:09.